Long standing - The work of many people happens that they have to work long hours of standing, which often complains of pain in the waist,it will be better if you get a chance to sit in the middle. And if you have a serious back pain then take care of this. Lifting heavy things - If you are troubled by the pain of the waist and still lifting heavy things,do not do it,it will further worsen the pain of your waist.Avoid lifting heavy items. Growing body weight - The increased weight of the body can also cause pain in your waist,so be careful to control the body weight.Increasing weight only does not affect our back but also affects other joints on the body. 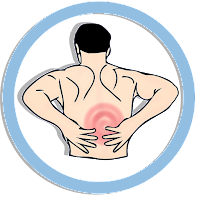 Wrong sitting or sleeping - Even sleeping or sitting in a wrong way can also lead to back pain. Many people are habituated to sleep and sit in the wrong posture,it would be better to change the habit today. Wrong exercises - If you have serious back pain problems,avoid doing some exercises in the gym such as both legs leg raises,heavy weight dead lift,heavy squat and tell about your back pain to your trainer so they can tell you exercises which be safe for your back.